The Maldives, an archipelago of 1,192 coral islands situated in the Indian ocean. 200 of its islands are inhabited and the rest just left in their natural state. The ideal destination for ‘getting away from it all’, the Maldives has over 90 resort islands to choose from. Sunny, warm and friendly the Maldive islands offers you the experience of a lifetime, both above and below water. Lying just across the equator southwest of Sri Lanka, the Maldive Islands are formed around 26 natural atolls. The most common mode of transportation is by Air. A few of the popular airlines to Maldives are; Emirates, Sri Lankan, Singapore Airlines, Malaysian Airlines, British Airways, Ethihad, Aeroflot, Edelwise, Qatar Airways and Condor. Both scheduled and charter airlines operate on a daily basis from destinations worldwide. The Maldives is a group of 1,200 tiny coral islands located just over 400 miles southwest of India and Sri Lanka, in the Indian Ocean. There are just over 110 resort islands and each resort is located on a private island of its own. In addition, there are 200 inhabited island communities. The rest of the islands are untouched. The shimmering white sand islands form a long double chain of 26 atolls. Here you can experience some of the clearest water in the world; abundant in tropical marine life including turtles, dolphins, manta rays and whale sharks. The coral reefs are beckoning for you to explore and with perfect beach weather practically all year-round, there’s never been a better time to visit. Dry season runs approximately from November to April, but even during wet season there can be days on end of sunshine, with only perhaps the occasional shower at night. 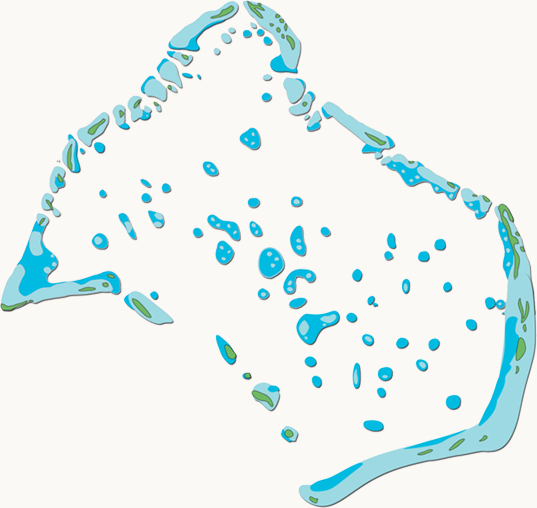 The Maldives is blessed with some of the lightest rainfall in the tropics. The world-famous resorts are the biggest man-made draw and there is something to suit most budgets – from opulent luxury to affordable accommodation. These resorts include an abundance of amenities and facilities including wonderful restaurants, decadent spas and well-quipped water-sports and diving centres. The Maldives is one of the most exclusive places in the world because of the concept of only one resort per island. Only guests and staff are allowed to enter the private islands. It means that the beaches never get over-crowded and you never get disturbed by traders selling knick-knacks. This extreme level of exclusivity means you feel almost as if you have the entire island to yourself at times, as you’ll just meet other guests from time to time, such as when you go for meals or if you join excursions. While the Maldives used to be almost exclusively a honeymoon destination, there are now also many resorts catering to families, with kids’ clubs and activities as well as sometimes even toys and games consoles in the villas, fun marine biology activities, or kids’ menus at the spas. With so much help on hand from the attentive staff, you can go and spend some well-deserved quality time with your significant other. The resorts of the Maldives are famous around the world for their exclusivity and luxury, as well as their breath-taking natural beauty. There is just one resort per island in the Maldives, which guarantees guests will have their own private slice of paradise. What not everyone knows is that there is something to suit almost every budget in the Maldives; from uber-luxurious 5-star retreats with personal butlers and private swimming pools to affordable and charming lower-budget options. No matter how much you pay, everyone experiences the same tropical sunshine and turquoise water that the Maldives is famed for. Talk to one of our Travel Consultants today to find out which island suits best your needs and desires. Maldives, has a history that goes back 2500 years. The Maldives practiced Buddhism until 1153 where then the country was converted to Islam. The earliest settlers were from the Indo Aryan race. Buddhism was the dominant religion of the people till 12th century when Islam took over the nation and remains unaffected. Throughout history Maldives remained an independent nation except for the 17 year occupation by Portuguese in 16th century and when she became a British protectorate in 1887, independence came in 1965. Later on they changed the government to a Republic from Monarchy. You will be granted a 30 day tourist visa arrival. No prior arrangements required. Archaeological finds indicate that the Maldives was inhabited as early as 1,500 BC. The population is thought to be descended from Indian, Sri Lankan, African and Arabic sailors and traders. Some academics suggest the very earliest Maldivians were sun-worshipers. Archaeological evidence shows the Maldivians used to practice an ancient form of Hinduism before adopting Buddhism in the 3rd Century BC. Permanent settlements were established in 500 BC by Aryan immigrants from the Indian subcontinent. The Maldives remained a Buddhist country for 1,400 years until 1153 when the last Buddhist king of Maldives converted to Islam and made it the official religion of the Maldives. The country became part of the Portuguese Empire in 1558 before the colonials were overthrown in an uprising 15 years later. The country was never part of the British Empire, but from 1887 to 1965 it was a Protectorate of Great Britain, before becoming a republic. The country is rich in folklore and one of the most fascinating stories is about a Moroccan trader who became a folk hero for supposedly slaying a sea monster – the king is said to have converted the country to Islam to thank him for his heroics. Traditional handicrafts are still practised today, including coir rope-making, weaving reed mats and creating beautiful lacquerware. The local cuisine is extremely popular among travellers. Some of the highlights include delicious fish curry, as well as mas’huni roshi (a breakfast made from tuna, onion, chilli and lime, wrapped in a very thin tortilla known as a ‘roshi’ and served with an egg on the side). The crystal-clear waters of the Maldives are an enticing 29°c on average all year round. With such glorious warm water, it is extremely appealing to all who visit. If you don’t stop to take a look at what’s beneath the surface, you’ll only see half of what the Maldives has to offer. The incredible underwater kingdom will reveal a treasure trove of surprises. The coral reefs and surrounding open ocean are home to more than 2,000 species of tropical fish. Just metres from your villa you can observe all kinds of colourful and exotic-looking creatures. Just the names alone conjure up all kinds of exciting images; angel fish, butterfly fish, anemonefish, squirrelfish and oriental sweetlips, to name but a few! Octopus, moray eels, turtles and small, friendly reef sharks also inhabit the reefs. It’s worth noting that, as in all oceans, there are some sharks in the Maldives. However, the majority are small and there have been no attacks reported in the Maldives since the 1970s. This is something that marine biologists attribute in part to the vast abundance of marine life in the Maldives and also the strict controls on fishing (only traditional methods such as pole and line fishing is permitted in the Maldives). If you embark upon a snorkeling or diving excursion from your resort you also may have a good chance of seeing two of the most spectacular creatures in the Maldives – the gentle whale sharks and the magnificent manta rays. Although this cannot be guaranteed, your resort will inform you when the best times for spotting them are. Swimming alongside one of the magnificent creatures is the experience of a lifetime. One of the best things about the Maldives is that you’re free to do as much or as little as you like. If relaxation is your main goal, the Maldives has some of the best spas in the world. These havens of tranquillity offer all kinds of health, beauty and wellness therapies including massages, facials, body scrubs, Ayurvedic treatments, yoga sessions, Pilates and much more. If you love adventure, then you can’t do better than exploring the water-world of the Maldives. Every resort offers guests snorkelling equipment rentals, so you can explore the house reef whenever you want to. (Please note that you must not stand on the coral reefs or touch marine life because it harms them). If you want to see even more, then sign up to a snorkelling excursion and explore new reefs and maybe even see a manta ray or whale shark. Scuba diving is the second-most popular activity in the Maldives, after snorkelling. Most resorts have dive centres on site, where you can sign up for taster sessions, become a certified diver or take your certification to the next level. They offer a wide variety of thrilling excursions around the area, showcasing some of the best dive sites in the world. All resorts also have water-sports centres. The activities vary from resort to resort but typically include kayaking, jet skis, parasailing, banana boats/fun tubes and knee-boarding. Sometimes there are even fly-boards, jet packs and underwater scooters too. Land-based activities vary but can include tennis, volleyball, football, cookery classes, handicraft demonstrations and sometimes even golf. There is something for everyone in the Maldives, including spas, water-sports centres, dive centres, marine biology centres, historical excursions, shopping excursions, yoga sessions, wellness activities and much, much more. Whether you want solitude and peace, and fun and excitement, we will help design your dream holiday. So, what are you waiting for? Make your dream vacation a reality and get in touch with our Travel Consultants today! Male’ is the capital city; the centre of commerce and a classic example of a bustling industrial South Asian city. What sets Male’ (pronounced ‘mah-lee’) apart from everywhere else is that the entire capital city comprises of one tiny 2.2sq km island. It is the second most densely-populated island in the world, with more than 150,000 residents. Scattered amongst the high-rise offices and homes are a few cultural gems, including the golden dome of the Friday Mosque, the lively markets, the multi-million dollar National Museum and Sultan Park. If you’d like to find out more about Male’, our Travel Advisors will fill you in. Most resorts organise optional day trips so visitors can explore Male’ and pick up some beautiful souvenirs. ‘Local islands’ or ‘inhabited islands’ are the name for island communities of Maldivians. These include cities such as Male’ and Addu City, as well as tiny rural islands with smaller populations. Resorts are always located on separate islands to the ones the island communities are located upon, but guest houses and city hotels are nestled right in the communities. All resorts organise day trips to local islands so that guests can gain an insight into traditional island life and also shop for souvenirs. We offer a selection of city hotels and guest houses on local islands. If you are interested in learning more about the local way of life, then they are an excellent choice. Please note that due to cultural sensitivities, alcohol is not legally permitted for sale nor consumption on local islands. Bikinis/swimsuits are restricted to specific private beaches on the local islands, for the same reason. However, alcohol and bikinis are freely permitted at all resorts. Our travel experts will be happy to answer any questions you may have about this. Due to the topography of the Maldives (1,200 tiny islands) the two principle ways of travelling around are by boat or seaplane. Seaplanes are typically used on journeys which would take over an hour by speedboat. Both boats and seaplanes can be arranged by private charter, or you can join an excursion or ‘photo flight’ from your resort. A photo flight is a round-trip flight departing from your resort and flying to another island or several islands. It is a fantastic opportunity to admire the Maldives from another angle and to take some superb photos. Typically, boat or speedboat excursions depart from a resort or guesthouse and last for anywhere between one hour and one day. Half-day tours are very popular choices. The destinations are usually Male’ or other inhabited islands, or some local snorkelling or diving points. There is also an inter-atoll public ferry network. Although the vessels are slow, it is a very cheap way for guesthouse guests to reach many islands. There are 26 atolls in total, aligned in two chains which cross the equator. The Maldives enjoys a balmy, tropical climate with a year-round average temperature of 30°c. Humidity is high in this equatorial archipelago but there is always a cooling sea breeze.